I have noticed THA is not on DarwinIA ranking this month despite good D-score and monthly gain. Is it because of completely full Cp? And is restriction done automatically? I was wondering about this question before, now we already have one good example? I would say that it is the second, the first filled is JMC . Thank you. So if your Cp is full and you have positive divergence then you can still participate in DarwinIA? My question is more regards idea presented by Darwinex that traders could limit max. investments. If this idea will ever see the light and if traders will choose to use the limit for the benefit of existing investors (if needed), than DarwinIA could spoil that limit if it is not automatic. Capaciy is an estimate, divergence is the current reality. DarwinIA could spoil that limit if it is not automatic. Of course it is automatic. Its very interesting to see what is happening with Capacity now we have a Darwin with a serious chunk of cash behind it and a relatively low capacity compared to the investment. THA is now well over €3m of investment but only has a capacity of 1.2mm. I would assume this is because it works on news events so the spread is a little wider and liquidity isn't as good. The result is a growing divergence, the monthly divergence is at 1.12% but the most recent jump up int he price has pushed the recent divergence up to 7.22%! Considering it seems to be adding about €100k of investment a day at the moment it will be interesting to see what happens. And we've found out, temporary pause on trading. 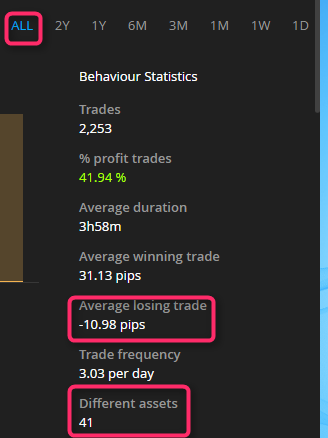 All period 10 pips average lost [image] On Month 3 pips average lost [image] A change of strategy with AuM growing ? I have the feeling CP matters NOTHING in my opinion. Ask Darwinex customer service about it (maybe I am wrong, but best traders has the worsts CP´s). Cp only estimates how mouch Money (investments) a Darwin probably can handle without a to high (negative) Divergence. It's not a statement of the quality of a Darwin! Darwins with a low Cp usually trade in low Timeframes and are just not able to handle to much money because the Lot sizes getting to big. I´d say you had a point here, but something is not correct in your statement. You can see the most succesful trader THA has a CP of 2.4. He has 784 investors and 3.5$ Million. His average trade duration since inception 3 years ago is under 4 hours, and in the last 12 months under 3 hours (low timeframes). He has made more than 400% of profit in three years...I know he´ve just stopped taking new investors temporarily (I guess until Darwinex change the way they place the investors orders in the market), and it is because the high divergency, but it is just happened now...so I think I don´t have to be worried about CP until I get at least 3M from investors...hahaha..:). Good trading! At the end of the month and getting close to the 31 days required for the algos I have seen my attributes now have data populated except Capacity. Any guesses on capacity with average win 7.9 pips, average loss 3.05 pips and average duration 32 mins? I reckon about 1 MM but I'm no pro.....I was just as anxious to find out what XII Cp was gonna look like.....but soon it will be revealed. I have looked now at the divegence. It's scary! How is that possible? PME: "strategy is based on trading high-impact news events"
volatility/liquidity and latency on trade entry with market orders? I'd be interested to know as well. I agree with Cavaliere, the key is not getting involved in bad Darwins. I just assumed that divergence happens and don't pay too much attention to it. Divergence erodes your profits it doesn't threaten you initial investment. THA has stacked a -16% divergence also in my community portfolio since the end of May 2017. Despite divergence it has a net profit of 30%. with all respect - no. Meanwhile (!) divergence has a much higher meaning as it shows the average divergence on EVERY trade. Right? So THA with 12,.. % divergence hast to make an AVERAGE of more than 13 percent on ALL trades, including the loosing ones, to bring some money to investors. That means .. about 20 or 25 % per winning trade? Do you believe this Darwin will do that? Darwinex NOW goes into a new stage where they have more investors than good enough traders (in the eyes of the investors losing money because of divergence while the trader is shown making money). If that's not correct, please explain detailed. Better proove it with screenshots from your real portfolio. Edit: @Chita: I asked whether this divergence was developed in the last weeks because I could watch it with VTJ in the last weeks.